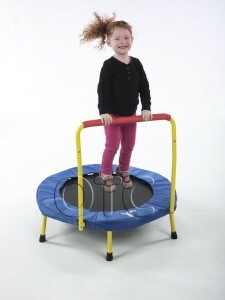 The Original Toy Company Trampolines - Trampoline for Me! 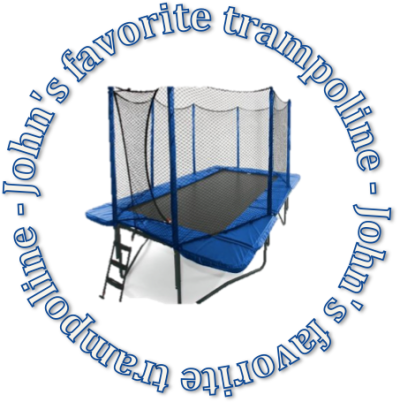 This is my number one pick as the best trampoline for toddlers for several reasons. So let’s talk safety first! This little one has 6 instead of standard 4 legs which provide for more stable construction. There are no springs here – they are replaced with series of heavy duty elastic straps, which makes it even safer. These are more durable than traditional bungee cords, so they are a great alternative to springs. Also, the side is padded for obvious reasons: so that your kid can be inside the circle of jumping and stay out of potential trouble. That is all there is to know about this one – and it is my favorite for the apparent reasons – it’s safe, durable, light and my wife could jump with kids. Splendid!